Acupuncture is sometimes used as an alternative treatment for eye health problems. Many people see results and benefits of acupuncture on their overall eye health. Studies show that acupuncture can help treat eye conditions such as dry eye syndrome. Acupuncture is a procedure in which thin needles are inserted through a person's skin at specific points on the body. Scientists are not sure exactly how acupuncture works but it has been shown to provide pain relief and alleviation of nausea secondary to cancer treatments. Acupuncture is thought to have begun in China. Historical accounts of acupuncture were also discovered in an ancient text in Japan and Korea. The goal of acupuncture is to restore balance and health by manipulating the flow of "Qi" (life force) through invisible tracts running from the head to the toes. These pathways also referred to as meridians, are separate from nerve and blood vessel pathways. Studies have shown that local accumulations of certain neurotransmitters by nearby nerves are manipulated by the insertion of needles and may be what causes beneficial health effects of acupuncture. According to some people, an imbalance in the body can show up as an eye problem or disease. When you have acupuncture, any imbalance that may be causing symptoms will be addressed. Eye acupuncture focuses on promoting circulation of Qi and blood around the eyes. Acupuncture is sometimes used as an alternative treatment for chronic dry eye syndrome. Studies have shown acupuncture to cause a reduction in the temperature of the eye surface that helps to reduce evaporation of the tears throughout the day. The procedure is also sometimes used to treat glaucoma. Glaucoma is a disease of the optic nerve that is usually caused by higher than normal levels of pressure in the eye. In one study, eye pressure decreased significantly after acupuncture. Another study showed that acupuncture successful reduced symptoms of allergic and inflammatory eye disease. The following areas are focused on during acupuncture for eye health. Jingming (UB-1) - Jingming means "bright eyes" and is located in the inner corner of the eye. This point is thought to bring Qi and blood to the eyes and to help eye problems such as cataracts, glaucoma, night blindness, conjunctivitis and blurry vision. Zanzhu (UB-2) - The Zanzhu point is in the crease at the inner end of the eyebrow. This point is the focus when patients complain of a headache, blurred vision, pain, tearing, redness, eye twitching, and glaucoma. Yuyao - Yuyao is the in the middle of the eyebrow right above the pupil. This point is used for treating eye strain, eyelid twitching, ptosis (upper eyelid that hangs low), cloudiness of the cornea, redness, and swelling. Sizhukong (SJ 23) - The Sizhukog area is located in the hollow area at the outside part of the eyebrow. 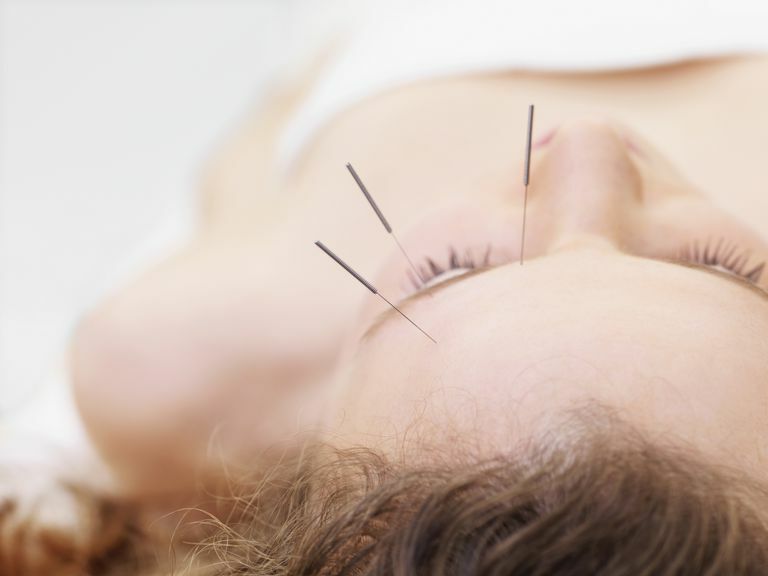 It is thought to be a point where acupuncture can be performed to help eye and facial pain including headaches, redness, eye pain, blurred vision, eye toothache and facial paralysis. Tongzilia (GB 1) - The Tongzilia is located on the outside corner of the eye. This point is thought to brighten the eyes. Manipulation of this point also treats a headache, redness, eye pain, light sensitivity, dry eyes, cataracts, and conjunctivitis. Until more acupuncture studies are completed, the best treatment approach for people with significant eye problems or disease may be a combination of traditional western medicine combined with acupuncture. Acupuncture has proven to be a safe alternative treatment for people who have not found a resolution to their eye problems by traditional means. Abelson, Mark B, and James Mclaughlin. Review of Opthalmology, Acupuncture: A Dry-Eye Therapy, 5 Aug 2013. Can Bilberry Improve the Health of Your Eyes? Why do you feel pain behind your eye? Cancer Affecting the Eyes Can Happen to Many People.